The shiny nearly-black berry, which is smaller than a gooseberry and a bit larger than a blackcurrant, is edible both raw and cooked. 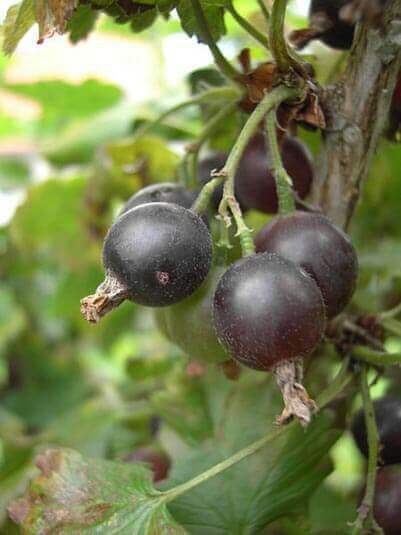 It is described as having a taste intermediate between a gooseberry and a blackcurrant, with the gooseberry flavor more dominant in the unripe fruit, and the blackcurrant notes developing as the fruit ripens. The ripe fruit will hang on the bush in good condition through late summer, but is very popular with birds. The somewhat unripe fruit can be used in cooking recipes as a gooseberry. Like blackcurrants the fruit freezes well, and like many other members of the Ribes genus it is rich in Vitamin C.